To perform an inner forearm middle block, you block with the bony area on the thumb side (or inner side) of your forearm. 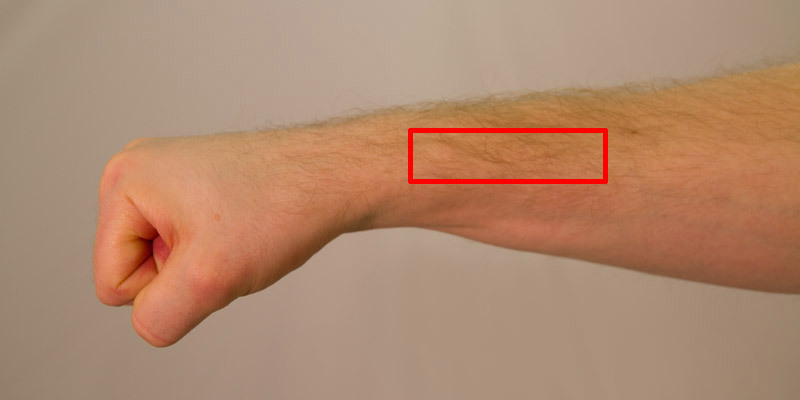 Like the outer forearm, it spans one third of the distance from your wrist to your elbow. The inner forearm blocking tool. 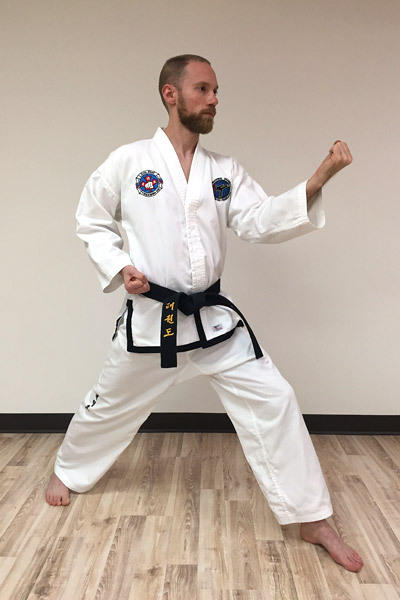 Like many blocks in Taekwon-Do, you prepare for an inner forearm middle block by crossing at the wrists. The arm performing the block should be on the bottom and both backfists should face the ceiling. (Or both palms should face the ground, if you find that easier to visualize.) Your bottom arm should be just below the top of your shoulder. The point where your arms cross should be at roughly the opposite chest line. By that I mean that if you are blocking with your left arm, the cross in your arms should be in front of the right side of your chest, just inside the shoulder. Reach your arms nice and far away from your body while still keeping a relaxed bend in the elbows. You’ll need to twist your body about an extra quarter-turn beyond the final facing for the block. Because this block finishes half-facing the target, you should turn to about ¾-facing for the preparation. Preparing for the block. The blocking arm crosses on the bottom and both palms face the ground. 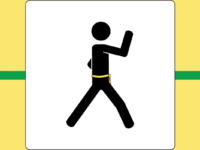 Move your arm in a straight line from the starting point to the finishing point, rotating your fist as you go. Most of the rotation happens near the very end of the movement. 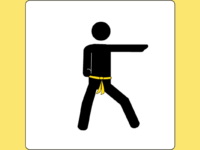 Your opposite hand comes back to your belt in a fist, with the backfist facing the floor (i.e. palm facing upward). Overlaying the preparation and finish points. 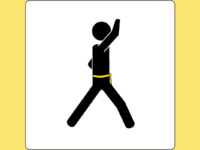 You should finish with your backfist facing your hypothetical opponent (i.e. your palm faces you). There should be almost a 90-degree bend in the inside of your elbow. Make sure to keep your wrist straight. The top of your fist should reach the top of your shoulder. The reason for this is that your hypothetical attacker is aiming for your solar plexus. 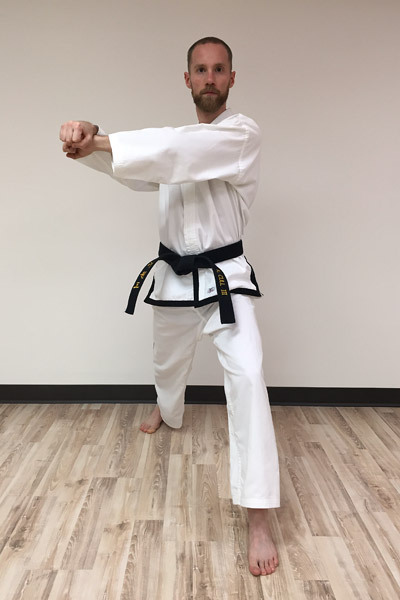 By positioning the top of your fist at the top of your shoulder, your blocking tool is in the proper position to block the attack. From the side. Make sure your elbow is bent nearly 90 degrees and your fist is level with the top of your shoulder. The blocking tool should finish in line with the centre of your shoulder. Also, make sure to drop your shoulder slightly at the moment of theoretical impact. Make sure your blocking tool is in line with the centre of your shoulder and your front shoulder is dropped slightly. If you’re doing an inner forearm middle block against a real, live partner, you should try to finish your block in line with the centre of your partner’s chest, if your block is travelling from the outside of their body toward the centreline. This is the ideal side to block from, because it sends the attacker’s arm across their body, making it harder for them to follow up. If your block is moving from inside to outside, you’ll want to finish half a shoulder width outside of your partner’s shoulder. Finishing at this distance means that you’re putting enough power in your block to properly deflect the attack, but no so much power that you overextend the block and leave yourself exposed. 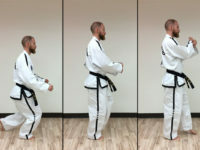 Finally, even though I’ve illustrated this block in walking stance, all the same rules apply in L-stance (or similar stances, for that matter). All the same principles apply in L-stance. Dear Sir, I’ve learned a lot from your explanation from your article. But I have one question I would like to ask….I know crossing the arms before the block can generate the power for the block. But, how does it generate? I’m afraid I don’t have an answer for you that I know is 100% correct. But I can take an educated guess. I don’t think the crossing itself has much to do with generating power. But extending your arms away from your body, opposite the direction that the block is travelling, gives you plenty of space to generate speed. And generating speed helps you generate power. If you prepare for the block close to your body, you don’t have that same amount of room to build up speed. 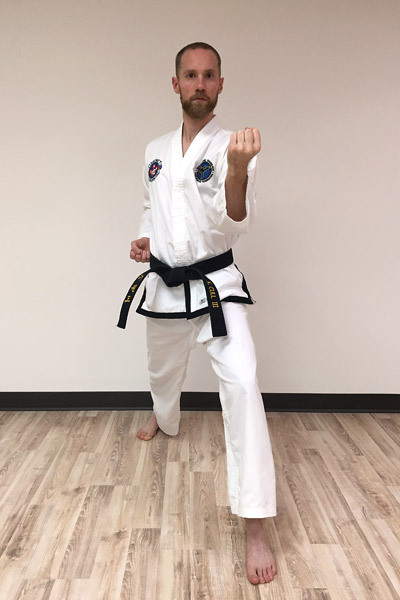 On top of that, your reaction hand will be travelling in more or less the opposite direction from the block, so you naturally have to cross your arms in some fashion to make that happen. For example, if you’re blocking with your right arm, your left arm pulls back to your hip. Your right arm is travelling from left to right, and your left arm is going right to left. So they have to cross somehow—although the actual “how” shouldn’t really matter for generating power. 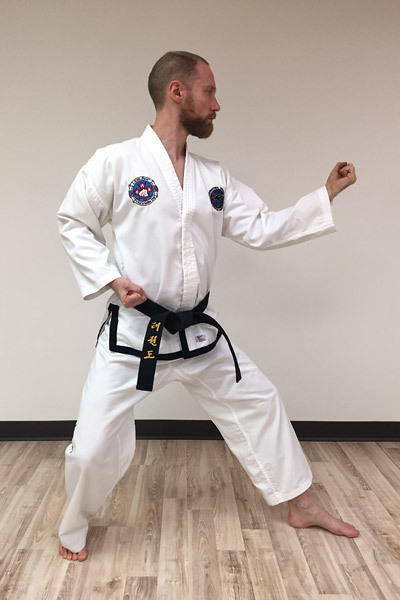 Most of our taekwon-do techniques are based on older karate techniques. 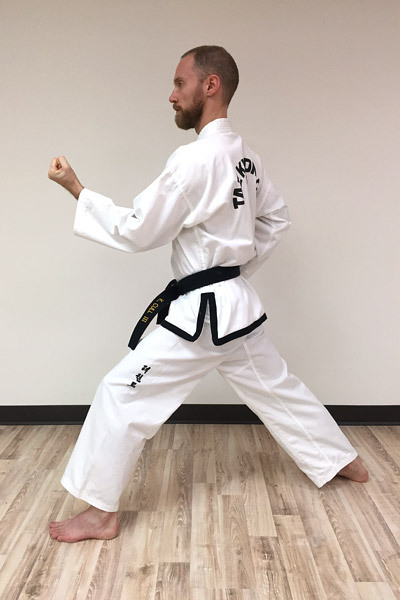 There are people who believe one of the purposes of crossing the arms in karate is that the cross itself is the block, and what we call the “block” is really a counterattack. 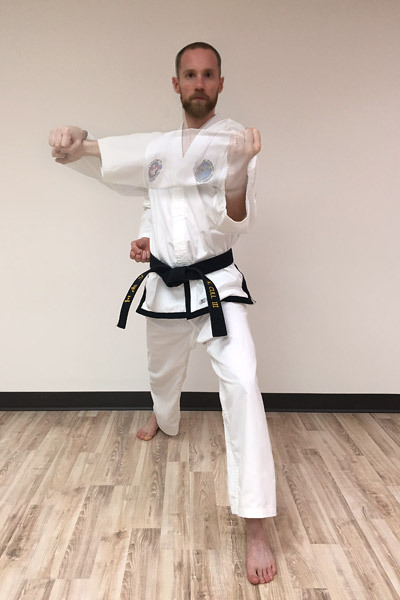 Karate blocks typically cross much closer to the body, which would make them more effective for blocking, but a crossed-arm block that’s farther away from the body could work in some situations as well. Thank you Sir for your quick response and explanation.